Would you like chickens with that? Chickens, cats, kids, books, craft, collecting, mothering and more! 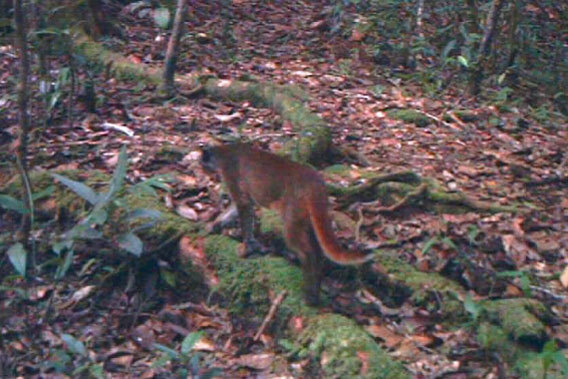 The elusive bay cat, taken by motion-triggered camera-trap in the Kelabit Highlands of Sarawak, Malaysian Borneo. Copyright: J. Brodie & A. Giordano. Although known to science for 138 years, almost nothing is actually known about the bay cat (Pardofelis badia). 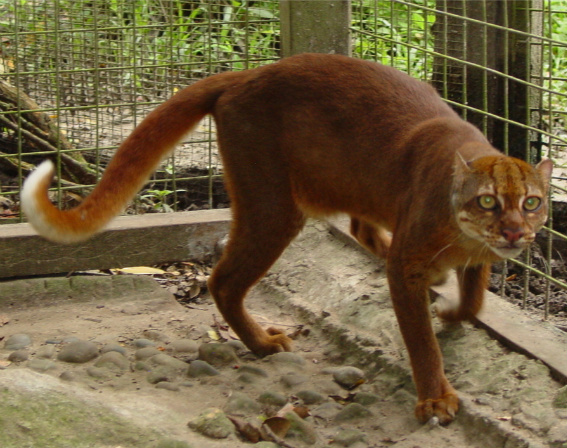 This reddish-brown wild feline, endemic to the island of Borneo, has entirely eluded researchers and conservationists. The first photo of the cat wasn't taken until 1998 and the first video was shot just two years ago, but basic information remains lacking. 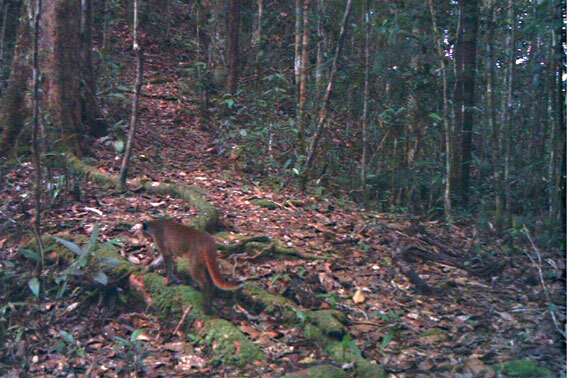 A new camera trap study, however, in the Kelabit Highlands of the Malaysian state of Sarawak has added to the little knowledge we have by photographing a bay cat at never before seen elevations. "We've never known conclusively whether the bay cat occurred at this high an elevation" said Jedediah Brodie, a Fulbright Research Scholar, who helped conduct the study. "Our record is an important contribution to existing knowledge of this unique and elusive species, and to this amazing ecosystem". 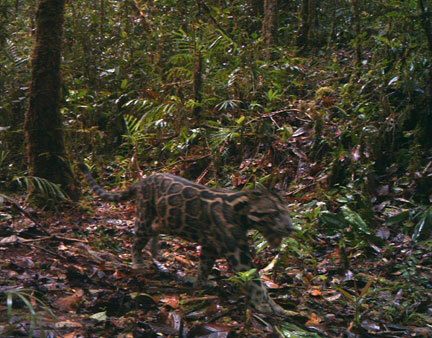 Top: Sunda clouded leopard also caught on camera trap in Pulong Tau National Park. 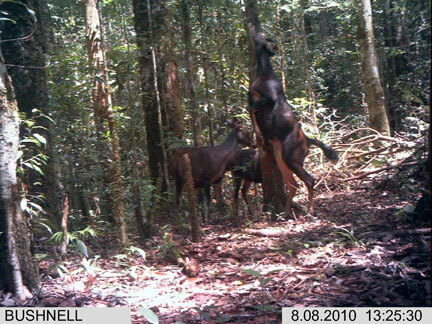 Bottom: sambar also photographed in Pulong Tau National Park. Copyright: J. Brodie & A. Giordano. The bay cat is listed by the IUCN Red List as Endangered. Thought to be naturally rare, the bay cat is also imperiled by deforestation due to logging and palm oil plantations on the island of Borneo, though the cat has been photographed in previously logged forests, but not plantations. The bay cat is not alone in its plight: four of Borneo's five wild cats are classified by the IUCN as threatened with extinction due to continued deforestation, but the bay cat is only one of those found no-where else in the world. "Although Borneo’s lowland forests are without question a primary regional conservation concern, we are only beginning to learn the wealth of biodiversity that these highland regions harbor," Anthony Giordano, the founder and director of S.P.E.C.I.E.S., a new carnivore conservation organization. "The fact that we now know the bay cat occurs here could change the way we approach future efforts to locate it." The conservationists warn that although the cat was photographed in Pulong Tau National Park, the park is only protected on paper. "This is a 'paper park' for sure, currently with no budget, no infrastructure, and no staff, including no park rangers" explains Brodie. "Given that we have recorded such a rich mammal fauna, we urgently need to see that it receives the additional scientific attention and protection it deserves." The camera trapping expedition also recorded several other endangered species including the Sunda clouded leopard (Neofelis diardi), marbled cat (Pardofelis marmorata), banded civet (Hemigalus derbyanus), sun bear (Helarctos malayanus), sambar (Rusa unicolor), bearded pig (Sus barbatus), pig-tailed macaque (Macaca nemestrina), Hose's langur (Presbytis hosei), tufted ground squirrel (Rheithrosciurus macrotis), and Bulwer's pheasant (Lophura bulweri), all of the above of which are listed as Vulnerable by the IUCN Red List. Captive bay cat. Photo by: Jim Sanderson. Close-up of bay cat. Copyright: J. Brodie & A. Giordano.